You can expect the same bespoke service from our Connah’s Quay branch as you would from our flagship hospital. The service you receive from veterinary centres just isn’t the same these days, is it? What happened to a family run business where the staff know your name and you trust them with every aspect of your pet’s health? 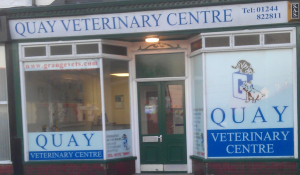 When you visit Quay Veterinary Centre the first thing you’ll notice is our backbone; good old fashioned values when it comes to animals. This centre in Connah’s Quay was the second branch to be added to the Grange Veterinary Hospital’s growing family. The Wignall family converted the building in 1984 and since then, the service we’ve offered has been unrivalled. Today the practice is increasingly popular because of its close proximity to town and excellent location on the high street; this is something you’ll probably appreciate too. We have treated thousands of pets over the years, even seeing generations of animal families. We would love to see you and your pet too. Our resident vet, Vicky Wignall, daughter of Richard who established Grange Veterinary Hospital, is always here to help you. So whatever your pet’s requirements, book an appointment with Vicky and her team by calling us today. If your pet has seriously injured themselves, or Vicky needs a specialised piece of equipment to diagnose your pet’s condition, she may invite you to Grange Veterinary Hospital. This is nothing to worry about, as our hospital is the best place for your pet should they need surgery or specialised procedure.